TAMPA, Fla. — Living in Florida means we share the state with an estimated 1.3 million alligators. As the weather warms and their mating season beings, you should keep these things in mind. Warm spring weather means alligators are more active and more visible, the Florida Fish and Wildlife Conservation Commission says. 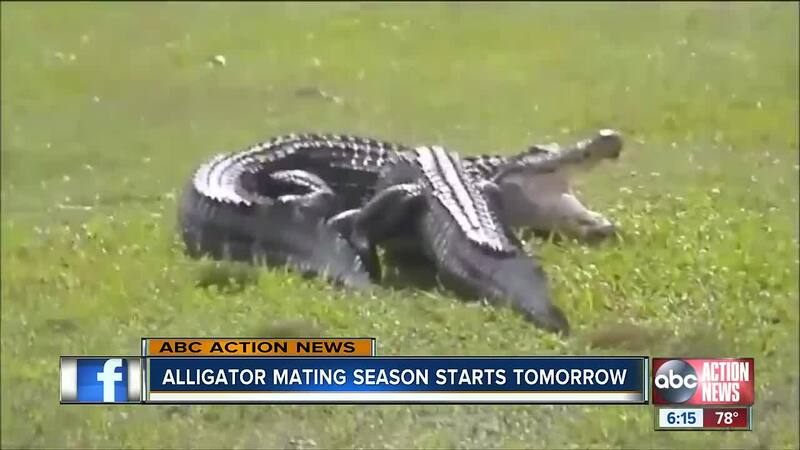 Their mating season begins in April then continues through May, or June. Rising temperatures increase an alligator's metabolism, which means they begin seeking prey, according to FWC. It also means they'll be observed basking in the sun as they regulate their body temperature. FWC also warns residents and visitors to never feed an alligator. It's not only dangerous, it's illegal. Feeding them can lead the animals to overcome their natural wariness of people and teach them to associate people with food. For pet owners, FWC has a special warning — keep animals on a leash and away from water because they can resemble an alligator's natural prey. Alligators are most active between dusk and dawn, so plan accordingly to reduce chances of running into them. Although many Floridians have learned to coexist with alligators, the potential for conflict always exists. 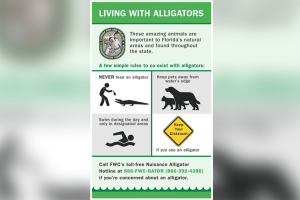 Serious injuries caused by alligators are rare in Florida, but if you are concerned about an alligator, call FWC’s toll-free Nuisance Alligator Hotline at 866-392-4286. The FWC will dispatch one of its contracted nuisance alligator trappers to resolve the situation. For more information, visit the FWC's website.